Summary: After a five thousand year-old ice man named Ötzi is found in Europe, Kit and his friend Ike are fascinated by how his mummified body and tools act as a time capsule from the distant past. When Ike suggests Kit should become a frozen man himself and a time capsule for the future, Kit agrees, and together they make plans of what should be included with his body to provide others with an accurate glimpse of life during Kit’s time. But as their plan gets closer to fruition, Kit’s behaviour becomes more and more erratic putting his concerned family on alert. As they struggle to figure out how to help him, Kit and Ike move ahead with their plan, encountering unexpected results. Review: In a story about one teen’s unwitting experience with mental illness, Kit and his friend Ike decide following in the footsteps of ice man Ötzi to become a human time capsule for the future is a good idea. Obsessed with providing a window into the past through the items he carries and his written manifesto, Kit also follows Ike’s lead by including drugs and condoms on his person for people to discover in the future. It’s not an easy story to read because of the subject matter but it’s also one you won’t be able to put down thanks to good pacing and engaging writing. Reading about Kit’s increasing paranoia, delusions and plans to commit suicide in a way he views as altruistic is gut-wrenching at times. Knowing Kit is completely unaware of the cognitive distortions he is experiencing is even more difficult, because he is a focussed and generally likeable character. What’s amazing about this book is K.L. Denman’s exquisite job of portraying all aspects of Kit’s experience. Her writing shows her reader exactly what is going through Kit’s mind, his logic and reasoning, the concern of his family and his downward spiral into mania that reveals itself most acutely in the statements he writes for his manifesto. I have a lot of respect for Denman as a writer because it’s clear how hard she worked to make each detail authentic. One of my memorable quotes is from Kit’s statement on Reality, written just before he went to climb the mountain, and copying it out required my full attention thanks to its lack of punctuation, specific errors and intentionally capitalized letters. What appears sloppy is actually genius on Denman’s part and very demonstrative of Kit’s mental state. The scene that struck me most though both times I read it was when Fred, Kit’s brother, realises what is exactly going on in Kit’s mind. It’s shocking and sad, and Fred feels the sorrow immediately when he understands at last. Denman’s portrait of a family struggling to figure out what is going on with their son and brother is informative and emotional, even though the reader is removed from it since the book is told from Kit’s perspective. All in all, it’s an important work of fiction and I would recommend it not only to mid to older teen readers, but also to those who are looking to get a insider perspective on mental illness. “The enormity of this realization washes over me in cold waves. It’s down to just me, Kit Latimer. Maybe Ike too, but that’s another thing; I haven’t heard from Ike since the day we took the Blackberry. Maybe he was caught and I’m on my own. 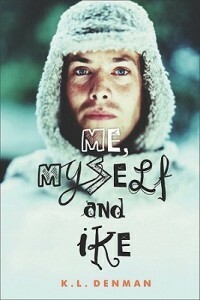 Me, Myself and Ike by K.L. Denman is published by Orca Books, (2009).